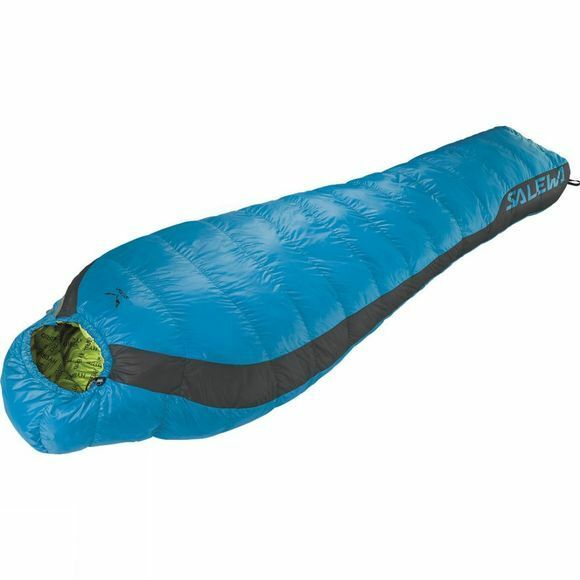 The Fusion Hybrid +4°C Sleeping Bag from Salewa has a blend of synthetic and down fill, for mountaineering, hiking and trekking in all conditions. Recommended when performance in both dry and wet conditions is a priority, the special fill is a 50/50 blend which combines the advantages of 90/10 duck down with PrimaLoft synthetic insulation. This results in a fill power of 650 cuin and a temperature rating of +4°C which dries four times faster than natural down and keeps 94% of its insulation capability even when wet. It has a full–length, two–way zip with anti–catch flap so it can be coupled with another compatible bag, or opened up wide like a blanket. It has a contoured hood, preshaped thermo collar and foot section and a zip at the foot section for comfort. All draw strings are easy to operate with one hand, and it's suitable for body lengths up to 185cm.